I've been enjoying my journey down the path of functional languages. I started with Clojure, than looked at Erlang, and now I am back at Clojure again. This post does not try to explain why you should look at functional languages, I assume you passed that since you're reading this blog post. The books will teach you the basic concepts. Those ideas vanish fast unless I practice them with a project or some kind of challenge. Programming quizzes or coding puzzles are a good way to exercise a new language. I usually start with the simple ones, and I work my way towards the more complex projects. The FizzBuzz kata is on the easier side, I was even asked to code it on a white board not too long ago. 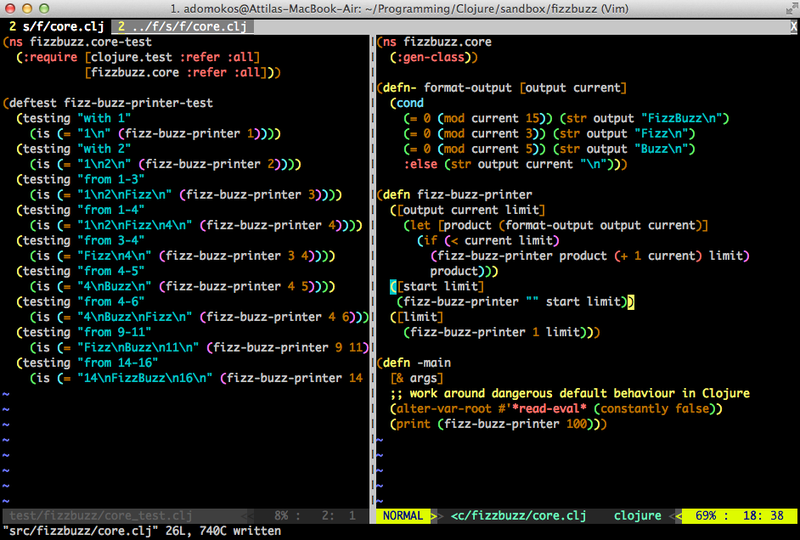 Here is how I solved the FizzBuzz kata in Clojure test driving it with its own test-is tool. I describe every changes I made, feel free to follow along by typing in the way I did it. I'll assume you have Clojure and Leiningen installed on your computer. Getting these tools is simple thanks to Homebrew on OSX. Please do a Google search if you don't have them already installed and you're using an OS other than OSX. I am using Clojure 1.5.1 version at the time of this writing. I generated a skeleton project with Leiningen:lein new app fizzbuzz. The directory structure had a src and a test directory. lein test runs the tests and lein run executes the program. 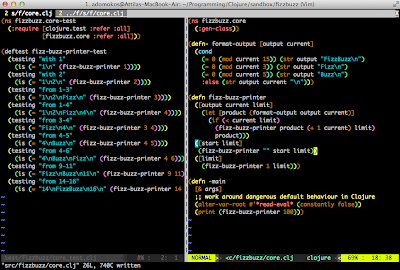 I put all my code in the src/fizzbuzz/core.clj and in the test/fizzbuzz/core_test.clj files. I write code in Vim, and I use a vertical split to look at the test and program files in the same window. I usually have the test on the left, and the code under test on the right hand side. This might need a little explanation. I chose recursion instead of using a loop. The fizz-buzz-printer function is overloaded: it accepts 1 (the limit) or 3 arguments (the output, current value and limit). The formatted string is captured in the product value. If the current value in the cycle is less than the limit I call the same function but the current value is incremented by one, and if not, I know I reached the limit and just return the formatted string - the product. I was ready for the fun part of this kata! For every number divisible by 3 I had to print out the word: "Fizz". Ran 1 tests containing 3 assertions. The function format-output is private, it's only visible within its own namespace thanks to declaring it with defn-. The increased complexity in the let function triggered the "extract function" refactoring. I felt the format-output function should be responsible for deciding if it has to print the number or the words "Fizz", "Buzz" or "FizzBuzz". All the tests passed. However, this code had duplication: the unary function (method with one argument) initialized the output just like the binary function. I decided to remove this duplication by changing the unary function to call the binary function that calls the ternary one. My next test covered the range from 4-6, where the word "Fizz" should be printed out for the number 6. All the tests now passed again. Ran 1 tests containing 9 assertions. And that's it! Please take a look at the final solution in this Gist. Hope you had as much fun reading this as I had preparing it.